Clear Your Living Quarters of Dangerous, Disease Carrying Rats, Mice and Larger Rodents with the #1 Rat Killer Trap by Kat Sense! Tired of messy, glue mouse boards and ineffective ultrasonic rat traps that only seem to teach the mice and rats how to escape them? Are you looking for an efficient, easy to use RAT trap that can guarantee you a 100% kill rate, every time? Then look no further than this set of high precision rat & mouse killer traps by Kat Sense! 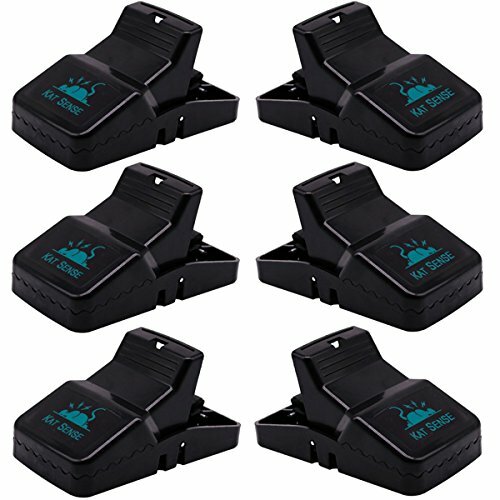 Powerful and extremely effective, this set of 6 rat traps offer the best solution for easy and mess-free anti-rodent protection and mice extermination with guaranteed, 100% kill results. Kat Sense rat traps are designed to kill the mice & rats quickly and with as little pain as possible, offering a humane solution to fight infestation. Backed by a full money back guarantee of complete satisfaction, you have nothing to lose! Order Your Set of 6 Rat Traps Today and Free Your Home from Uninvited Rodent Guests! Click "Add to Cart" Now, before you get an infestation! • GET IT RISK-FREE: Being so sure about the top quality and excellent performance of our rat traps, we are able to offer you a hassle-free money back guarantee of complete satisfaction. In the unlikely event that these effective mice traps don't meet or exceed your expectations, you can return them for a full refund of your purchase, in no time. Can you really afford to miss this offer? If you have any questions about this product by Kat Sense, contact us by completing and submitting the form below. If you are looking for a specif part number, please include it with your message.